Northern Light Technologies SAD Elite Therapy Lamp Box. Clients tell us they like the SADelite because it is very user friendly. Clinicians say this results in higher compliance. SADelite is recommended by thousands of physicians and health professionals around the world. 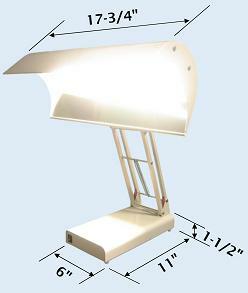 SADelite is a bright light therapy product of top quality, affordable price. 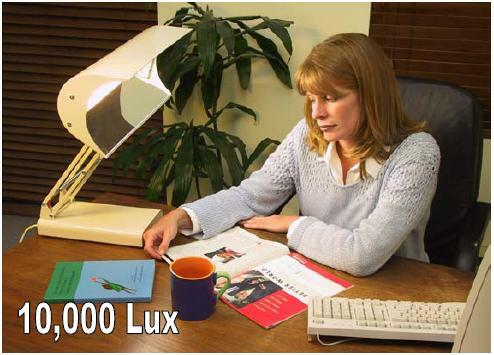 A powerful light box designed as a completely adjustable desk lamp, lets you enjoy 10,000 lux, with unmatched comfort. If you have any questions regarding the item please give us a call at (800)355-2956. The SADelite delivers bright light by combining high-output fluorescent tubes with a large high-performance parabolic reflector. This results in a highly efficient unit that draws ONLY 85 watts, yet delivers 10 000 lux. The power in our unit is channeled into light, not heat. The lamp height and angle adjustments allow you to obtain maximum comfort while enjoying the SADelite. Additionally, our large reflector provides diffuse bright light without losing intensity rapidly as you move away from the lamp. The SADelite can also be used at home or at the office, for any task that requires bright lighting. - Unique, affordable, high quality product, compact and adjustable. - Power : Universal - Lamp automatically selects from 110-270 volts, 50 or 60 hz.